For Congress to “decide whether” to raise the debt ceiling, for programs and tax rates it has already voted into law, makes exactly as much sense as it would for a family to “decide whether” to pay a credit-card bill for goods it has already bought. I’m not a supporter of President Obama, but if I thought that balancing the federal budget was the overriding issue, I would vote for him. On fiscal matters, he is a better conservative than the present Republican Party leadership. Remember that the fiscal year begins in October of the previous year. The 2009 fiscal year began Oct. 1, 2008, and so is the responsibility of the George W. Bush administration, except for the stimulus program enacted after Barack Obama took office. 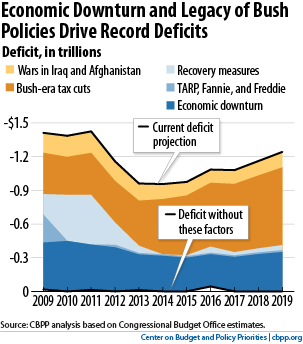 The main causes of the federal budget deficit were the tax reductions proposed by President George W. Bush, the cost of invading Iraq and Afghanistan, and the Great Recession, which reduced tax revenues while automatically increasing spending for the social safety net. Recall that when President George W. Bush took office, he and Federal Reserve Chairman Alan Greenspan thought that federal budget surpluses were a problem, and Bush’s tax reduction program was intended to eliminate those surpluses. I see little hope of balancing the federal budget until (1) the Clinton era tax rates are restored, (2) military spending is brought under control and (3) the Great Recession comes to an end. President Obama has proposed restoring Clinton era taxes on upper-bracket taxpayers, and he is reducing the size of the U.S. military (although not cutting back on its mission). Obama’s embrace of drone warfare is, I think, partly for budget reasons, like the Eisenhower-Dulles “massive retaliation” policy of the 1950s. The most important step to bring the federal budget under control would be to bring the Great Recession to an end. 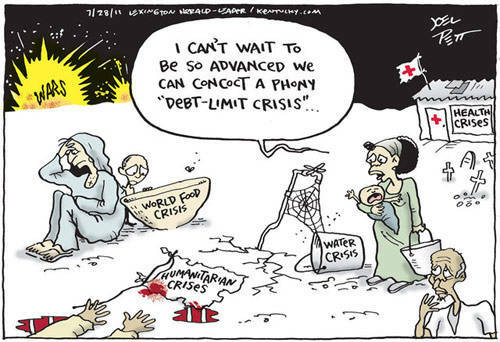 Budget problems, like other problems, are relatively easy to solve under conditions of peace and prosperity. So long as unemployment is high and poverty is increasing, tax revenues will be low and spending on the social safety net should be relatively high. Newt Gingrich called President Obama the “food stamp” President. The present food stamp program was created by bipartisan legislation in the 1970s co-sponsored by Senators Robert Dole and George McGovern. The reason spending on food stamps is high is because the Great Recession is pushing people into unemployment and poverty-wage jobs. We should not change the law and let children go hungry, but by work toward a high-wage, full employment economy in which hard-working people won’t need food stamps. 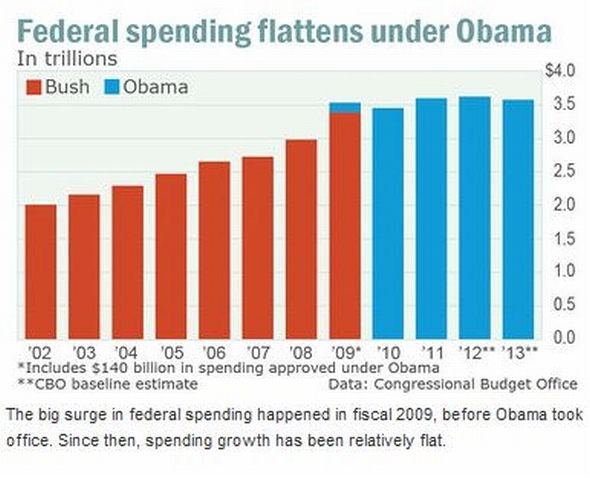 Click on Marketwatch: Obama spending binge never happened for background and the source of the first two charts. Click on The Four Causes of the Huge Deficit for more background and the source of the next to last chart. 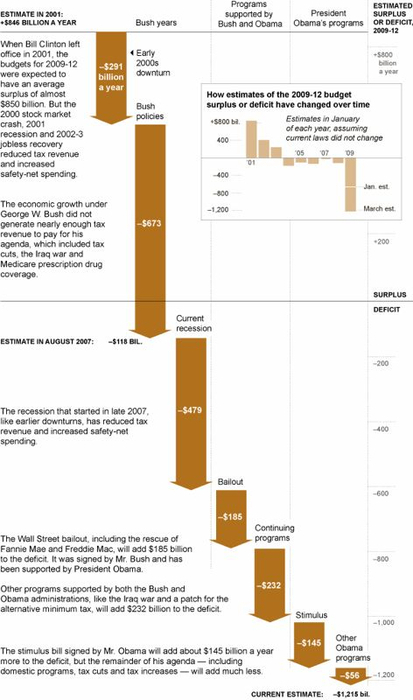 Click on Causes of the Trillion Dollar Deficits for more background and the source of the bottom chart. Click on Greenspan Endorses a Cut in Tax Rate for an article from 2001 about how Federal Reserve Chair Alan Greenspan and President George W. Bush wanted to get rid of budget surpluses. Click on ‘Reagan Proved Deficits Don’t Matter’ for comment on the Crooks and Liars web log on changing Republican attitudes toward the deficit. 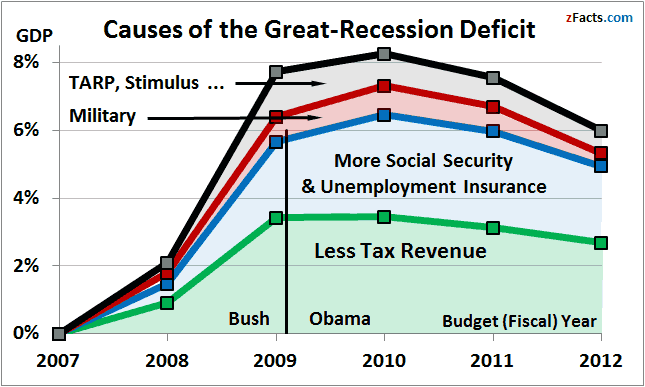 Tags:Barack Obama, Democrats vs. Republicans, Obama, Who Caused the Deficit? 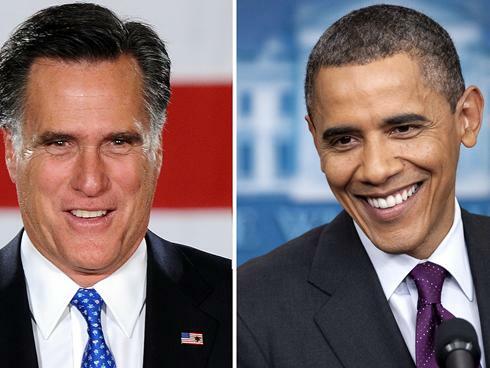 On economic policy, American voters in November will be offered a choice between Mitt Romney, who is part of the problem, and Barack Obama, who is not part of the solution. I’m not happy with President Obama, but Gov. Romney is no improvement. Neither Obama nor Romney have realistic plans for unemployment or mortgage foreclosures. Both regard the federal budget deficit as a higher priority problem. But Obama at least has a realistic budget plan, and his record on federal spending is much more conservative than most of his admirers or detractors admit. Romney proposes further tax cuts for upper-bracket taxpayers, which will make the problem worse. Obama has not shown the least willingness to curb the irresponsible behavior of the financial elite which has brought on and prolonged the current economic recession. Romney is part of that financial elite. Both Obama and Romney regard Social Security and Medicare as “entitlements” which need to be cut back. Obama repeatedly has offered up cuts in Social Security and Medicare as part of a grand bargain for balancing the budget. Romney is an admirer of Rep. Paul Ryan of Wisconsin whose ultimate goal is to privatize Social Security and Medicare. Romney scapegoats poor people, while Obama doesn’t talk about them at all. President Obama’s economic policies follow in the footsteps of President Eisenhower and the first President Bush. Governor Romney’s policies, based on his statements and his choice of advisers, would follow the second President Bush and the Tea Party movement. If Obama and Romney were my only choices, and economic policy the only important issue, I would reluctantly vote for Obama. But since I live in a state where third party candidates are on the ballot, I will vote for Gary Johnson, the Libertarian candidate, or perhaps Jill Stein, the Green Party candidate. Click on How Paul Ryan Captured the G.O.P. for a profile of Rep. Paul Ryan of Wisconsin, the architect of Republican economic policy, by Ryan Lizza in the New Yorker. Click on Romney Tax Plan on Table, Debt Collapses Table for a report on a bipartisan analysis of Gov. Romney’s tax proposals. Romney has not given specifics for an excellent reason. It is mathematically impossible for him to deliver his proposed tax cuts for rich people and still balance the budget by closing loopholes. 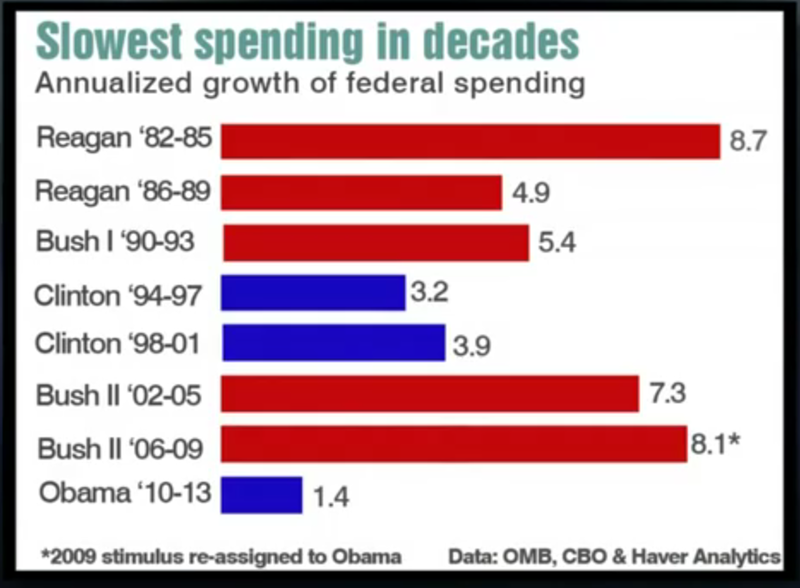 Click on Obama spending binge never happened from MarketWatch and Who Is the Smallest Government Spender Since Eisenhower? Would You Believe It’s Barack Obama? from Forbes for President Obama’s record on government spending. If I were a conservative Republican who believed that cutting government spending was the overriding issue, I probably would vote to re-elect the President. Click on Obama’s Second Term Agenda: Cutting Social Security, Medicare and/or Medicaid for analysis by Matt Stoller of the Roosevelt Institute, based on the President’s proposals and appointments during his first term. Click on U.S. poverty heads for highest level in 50 years for a Chicago Tribune article on a subject neither candidate talks about. The nonsense about Barack Obama being the “food stamp” President reflects the fact that the deep economic recession has made huge numbers of people eligible for the program that was put in place in the 1970s. 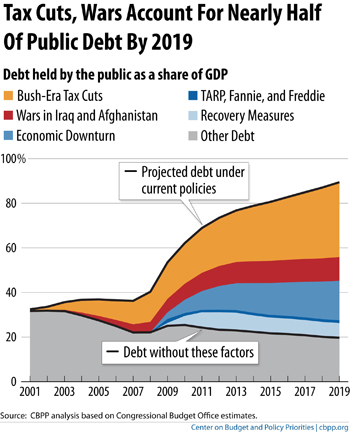 Click on The Choices Still to Be Made in the New Debt Deal for the source and context of the chart. Tom Ferguson, a professor of political science at the University of Massachusetts and a fellow of the Roosevelt Institute, has a lot of good sense and good insight about current issues. Here he is in an interview in July about President Obama, the Congress and the debt ceiling. [Added 2/16/2019] Click on this link to view the video. Can we do without military Keynesianism? It is interesting how some people who disbelieve in the power of government to do anything about unemployment also believe there is such a thing as “war prosperity.” During my life I’ve heard many people say that it was World War Two, not the New Deal, that ended the Great Depression. To the extent that this is true, all it means is that the level of government spending in the 1930s was too modest. Here’s a quote from Judson Phillips, a Tennessee lawyer who heads Tea Party Nation. Increasing spending for the military does a couple of things. It not only not only stimulates the economy, it protects our nation. That is a better investment than say spending money on teaching Chinese prostitutes how to drink responsibly. But there are those on the opposite side of the political fence who are just as inconsistent. Many advocates of economic stimulus programs believe it is possible to make deep reductions in the armed forces and military spending without any adverse effect on employment and the economy generally. 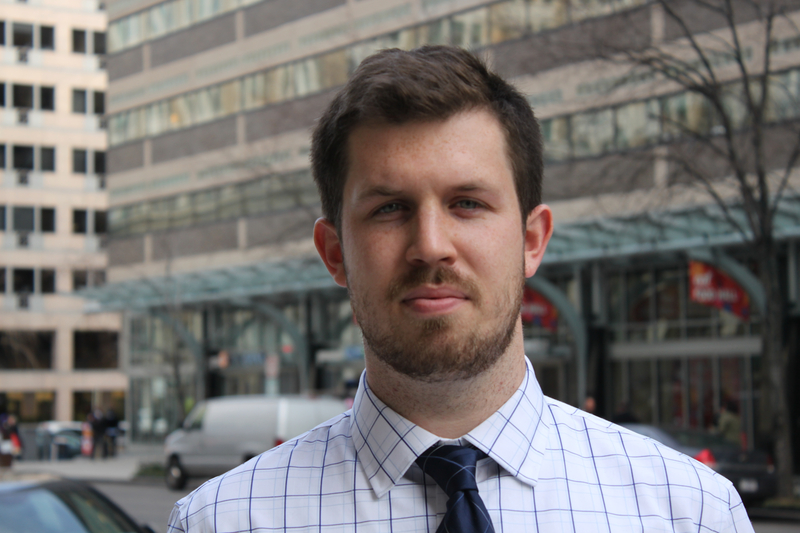 If Judson Phillips favors military spending as a job-creating measure, and opposes spending on infrastructure construction to create jobs, that is inconsistent. But many members of the Tea Party movement do in fact want to cut military as well as civilian spending. The Obama administration is more in line with Judson Phillips than some of his fellow Tea Partiers are. Defense Secretary Leon Panetta has warned against any real cuts in military spending (he favors only a slowing in the rate of growth) and says cuts should be concentrated on discretionary non-military spending as well as Social Security, Medicare and other entitlements. I do not think the declining U.S. economy can sustain military bases and military operations all over the world. I think the size and mission of the U.S. armed forces are excessive compared to what is needed for defense of the homeland. But if the armed forces and military spending were shrunk to what is necessary, and nothing is else changed, this is going to raise the unemployment rate. We need a change in priorities, not just cuts in spending. I asked a Canadian friend how it is that Canada has a much stronger social safety net than does the United States, yet has a smaller national government debt in relation to the size of the Canadian economy (gross domestic product). 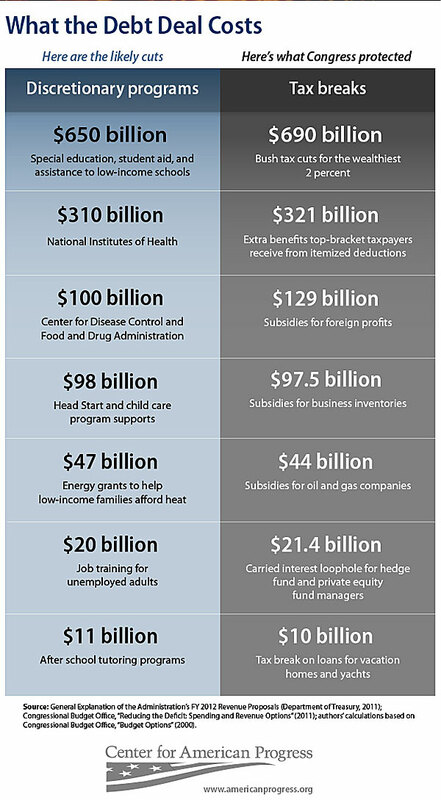 The Obama-GOP plan cuts $917 billion in government spending over the next decade. Nearly $570 billion of that would come from what’s called “non-defense discretionary spending.” That’s budget-speak for the pile of money the government invests in the nation’s safety and future—education and job training, air traffic control, health research, border security, physical infrastructure, environmental and consumer protection, child care, nutrition, law enforcement, and more. 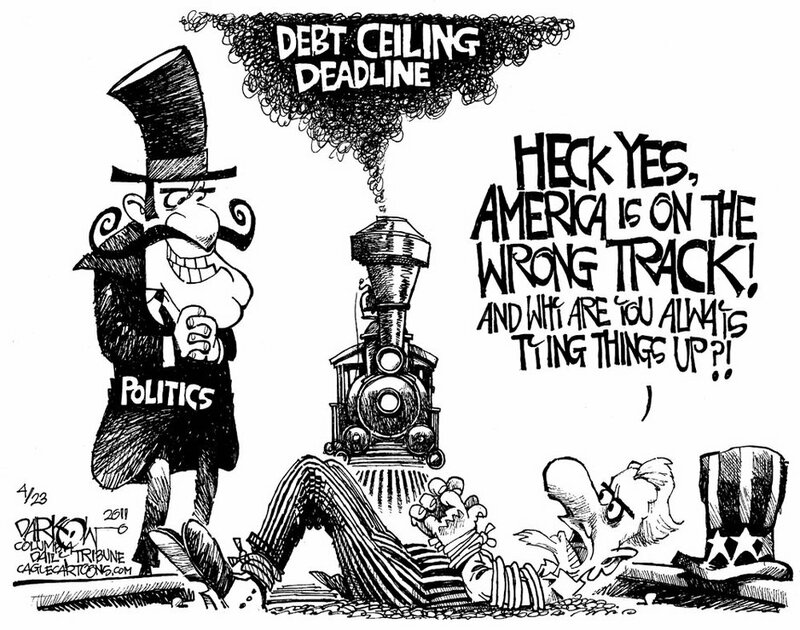 Moody’s and Standard & Poor’s threaten to downgrade U.S. debt despite the debt ceiling deal. Why? Economists said it remains doubtful that major ratings agencies — Standard & Poor’s Ratings Service, Moody’s Investors Service and Fitch Ratings — will allow the country’s AAA rating to remain in place. One theory is that the ratings agencies are getting tough with the U.S. government to redeem themselves from their blunders of the past—all the risky corporate securities that were rated AAA before the Great Recession. Many countries have suffered financial crises. The United States is exceptional in creating a financial crisis where none existed before. 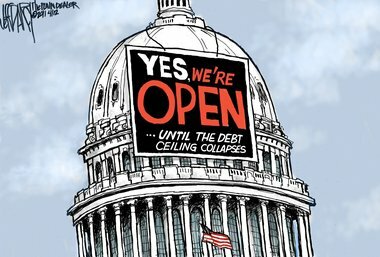 The debt ceiling crisis would not have been a crisis unless political factions in Washington had not decided to create for their own purposes. It is an example of what Naomi Klein called The Shock Doctrine — how political and economic elites use crises to force changes on the public they would not have accepted otherwise. The Associated Press reported that the bipartisan agreement signed by President Obama and House Speaker John Boehner provides for an immediate $900 billion in reductions in discretionary spending over the next 10 years, followed by an addition $1.5 trillion in spending reductions to be proposed by a bi-partisan committee of Congress by November and to be voted on by the end of the year. If that happens, the debt ceiling would go up by $1.5 trillion; if not, $1.2 trillion in spending cuts would take place automatically across the board. Social Security, Medicaid and food stamps would be exempt from the automatic cuts, but apparently not from the cuts proposed by the bipartisan committee. Since the agreement does not specify exactly what will be cut, it is hard to argue against it based on specifics. But once the cuts are specified, it will be too late to do anything about them. The agreement pretty much commits the President and Congress to accept whatever is proposed. That first round of cuts to discretionary spending might reduce some waste, but it would also undermine vital government services. At the same time, it would deplete the opportunities for easy spending reductions, making it more likely that second round of cuts had an equal, or harsher, impact. … There’s just no way to enact spending reductions of this magnitude without imposing a lot of pain. And contrary to the common understanding in the Washington cocktail party circuit, “pain” does not simply mean offending certain political sensibilities. Pain means more people eating tainted food, more people breathing polluted air, more people pulling their kids out of college, and more people losing their homes — in other words, the hardships people suffer when government can’t do an adequate job of looking out for their interests. More immediately, but equally troubling, this agreement would not address our most pressing economic problem: lack of jobs. On the contrary, by reducing deficits starting next year, this deal would do the very opposite of what virtually every mainstream economist now believes we should do: increase consumer demand by pumping more money into the economy. At one point, the debt ceiling agreement included promises to extend unemployment insurance and renew a break on the payroll tax. Those two would have provided a modest but very real boost to the economy (not to mention financial relief to people who need it). This deal would do neither. Most Americans are relieved that the government is not going to default on its bond payments or delay payments of government salaries or Social Security pensions. It makes President Obama’s proposals, which once would have been considered an extreme right-wing agenda, seem reasonable in comparison. 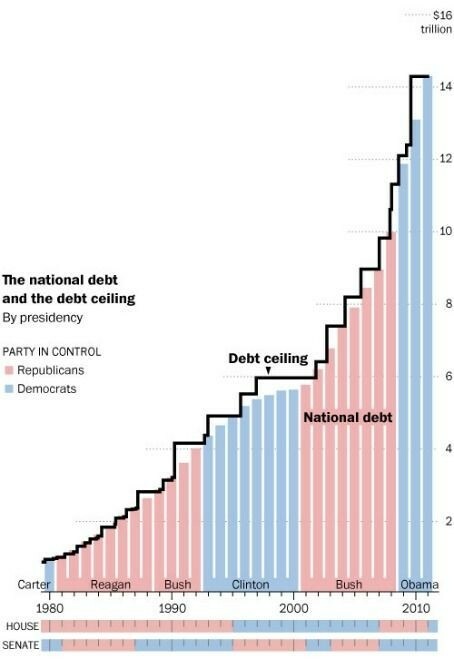 But the debt ceiling crisis is not over. It has merely been postponed until after the 2012 election. After that we can expect a continuing series of debt ceiling crises, as long as (1) the debt ceiling exists and (2) a 60-vote majority requirement in the Senate gives any 41 Senators a veto over government policy. What is there for a Republican to dislike? Senate Minority Leader Mitch McConnell proposed giving President Obama the responsibility for addressing the federal budget deficit. If I were a conservative Republican banker, I would be very happy to entrust President Obama with that responsibility. Just a year before a general election, the country’s unemployment rate is over 9 percent and its effective unemployment rate might be twice that. 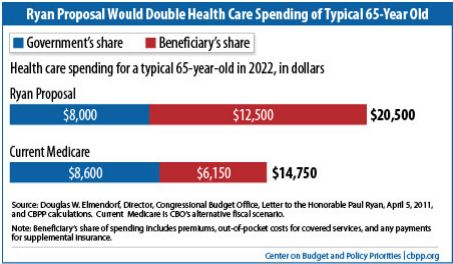 Obama’s solution to the searing crisis of the middle class apparently is to raise the Medicare eligibility age from 65 to 67, in exchange for tax increases that will occur anyway. Oh yes, and $2 trillion of other unspecified cuts, which always figure to work beautifully during a recession. … What is there in any of this that a progressive could possibly object to? President Obama has managed to make McConnell, House Speaker John Boehner and House Majority Leader Eric Cantor look like fools, by conceding the substance of what they demand. His characteristic political tactic—giving his opponents enough rope to hang themselves—has worked well for him once again. At the same time he has abandoned historic Democratic principles and constituencies. What price victory? Zasloff sees two ways to interpret President Obama’s actions. 1. Obama is a Democrat, and he is a political moron. 2. Obama is a Republican, and he is a political genius. Source: Office of Management and Budget. Click to view. The majority of Democrats say that the federal budget deficit should be addressed by raising taxes and cutting spending. The majority of Republicans say that the federal budget deficit should be addressed by cutting spending and taxes under no circumstances should be raised. Based on the chart, I would say the Democrats have the better of this argument. 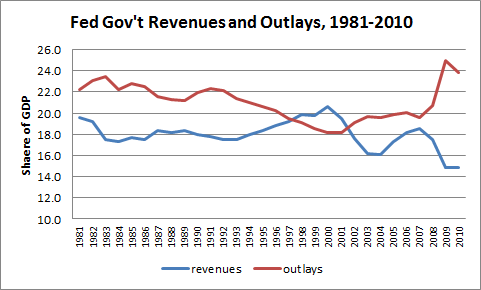 Notice that the only time in the past 30 years that revenues exceeded expenditures was during the Clinton administration. This is partly a technicality of accounting; the surplus in the Social Security Trust Fund was used to offset the general government’s deficit, even though Social Security is kept separate from the general budget. It also reflects the moderate tax increases enacted during President Clinton’s first year, and the work done by Vice President Al Gore to improve governmental efficiency and reduce civilian important. Even so, President Clinton did not project a budget surplus. What brought his administration into the black was the economic boom during his second term. During the George W. Bush administration, spending increased, covering the cost of wars in Iraq and Afghanistan and a new Medicare drug benefit, and taxes were cut. The recession caused spending to increase and tax revenue to fall during the last Bush years, and the gap has grown even greater during the Obama administration. The Republican leadership – Senate Minority Leader Mitch McConnell and House Speaker John Boehner – say that the deficit is the overriding problem, and non-military spending can in no way be increased. But when possible tax increases come up, they say that you shouldn’t raise taxes during a recession—in other words, that the recession, not the deficit, is the overriding problem. My own view is that as a result of the deindustrialization and financialization of the U.S. economy over several decades, we have to think not just about the deficit and not just about restarting the economy, but about rebuilding the nation’s economic strength. 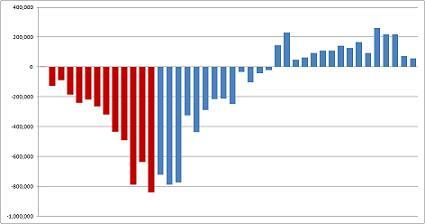 Chart shows monthly change in private-sector jobs under Bush (red) and Obama (blue). Chart by Steve Benen of Washington Monthly. Click to view. 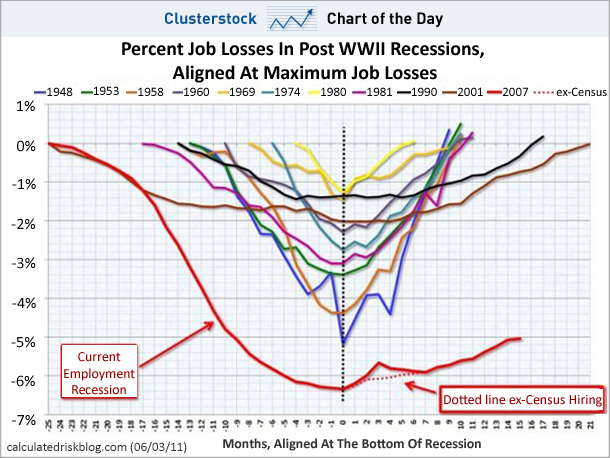 Chart shows monthly jobs loss or gain in the current recession compared to earlier recessions. Double click to view or enlarge. The U.S. economy is showing some recovery, and reputable economists agree that the Obama stimulus program did some good, but the economic recovery is stalling, and we have a long way to go before we get back to the way things were before the recession. It would be nice if President Obama, House Speaker John Boehner and other top leaders would show as much concern about the jobs deficit as they do about the federal government’s budget deficit. Even if you think the latter is the only thing that matters, a lot of the deficit is due to the fact that recession has sidelined millions of people willing and able to work and pay taxes. The Republican Party is amazing. The Republicans, after winning a majority in the House of Representatives, have done more to change the direction of the country than the Democrats did in the two years that they controlled the Presidency and had majorities in both Houses of Congress. President Obama has agreed to shift from doing something about the present unemployment and foreclosure crises to addressing the future federal budget deficit. And he has further agreed that the federal budget will be balanced largely at the expense of the elderly, the sick and the unemployed rather than upper income taxpayers. And even with this, it is still an open question as to whether the Republicans will accept Obama’s terms or force the federal government into defaulting on its debt anyway—resulting in loss of faith in U.S. financial solvency and higher interest rates for decades to come and maybe indefinitely. Either President Obama is an exceptionally weak President, or his priorities are different from what his supporters assume they are. Just as only a supposedly conservative Republican could go to China, only a supposedly liberal Democrat can cut Social Security and means-test Medicare. If this is what the President had in mind to do anyway, his supposed dilemma is not a dilemma. He is like B’rer Rabbit being thrown into the briar patch. I had to smile at Nelson’s idea of what government help is and isn’t. But when I viewed the whole segment and listened to his full comments, I found that I sort-of halfway agreed with him. It doesn’t make sense to continue with bailouts, subsidies and special tax breaks for big corporations, and at the same time cut back on education, fire protection and other basic services, on taking care of our veterans and, yes, on food stamps and unemployment compensation for people temporarily down on their luck as Craig T. Nelson once was. I don’t see eye to eye with Nelson in every respect. I think he probably gets too much of his information from Fox News. I think the Glenn Beck wing of the Republican Party is part of the problem rather than part of the answer. But I think Nelson’s moral outrage at our current national priorities is thoroughly justified, and I even agree with Glenn Beck on recommending people read the Declaration of Independence and Tom Paine’s Common Sense. Standard & Poor’s Corp. announced yesterday that the United States government was on its watch list to lose its AAA rating for government bonds. AAA is S&P’s highest rating for safety. The United Kingdom also is on the watch list, and Japan has lost its AAA rating. This is a big deal because the lower the credit rating, the higher the interest rate a borrower must pay to get credit. It is amazing to me that S&P ratings are still taken seriously. S&P, along with Moody’s and Fitch’s, the other two big credit rating agencies, gave AAA ratings to mortgage-backed securities, leading millions of gullible investors to think they were safe investments. Mortgage defaults led to the crash on these securities, bringing on the financial crisis and the recession we now are in. Yet little or nothing has been done to improve the rating system, establish regulatory oversight or hold the rating agencies accountable for their results. The recession made the government lose revenue and increase spending, which is one of the main reasons why the United States is in a debt crisis – if it is. So S&P, which helped create the problem, is dictating to the United States government what to do to solve the problem. I wrote “if it is” because the U.S. ratio of debt to Gross Domestic Product is slightly less than the world average, and countries such as Germany and France, which have a higher debt to GDP ratio, also have a better credit rating. The U.S. government, unlike the Wall Street banks, does not pay S&P for its credit rating, so maybe its rating of Treasury bonds is unbiased. On the other hand, maybe S&P is merely pushing the Wall Street political agenda, to ignore unemployment and cut the deficit. 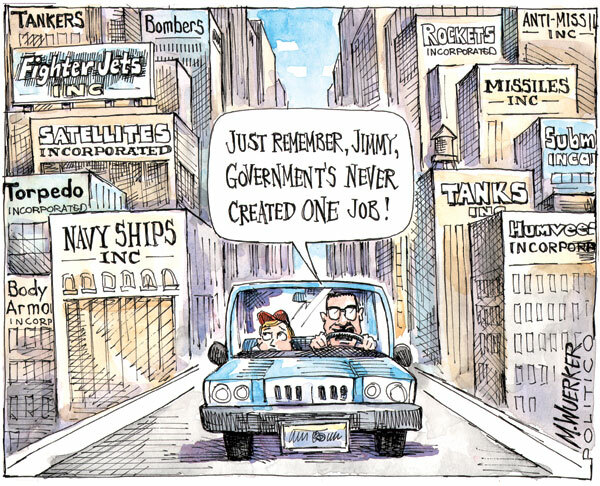 Instead of the government regulating Wall Street, Wall Street is dictating to the government. Nine Things The Rich Don’t Want You to Know About Taxes by David Cay Johnson. Five Ways GE Plays the Tax Game by Jeff Gerth of ProPublica and Allan Sloan of Fortune. Click on the links to read them.